As we profess our faith in Christ, remember it will be tested. Most likely the test will come against something dear to our hearts. Abraham, the father of our faith, encountered such a dilemma. When he was ninety-nine, God made a covenant with him. The Lord changed Abram’s name to Abraham, meaning the father of many nations. With his new name came a promise. Abraham’s barren wife Sarai/Sarah would miraculously bear a son. It would be through Abraham’s son Isaac, that his descendants would come (Genesis 17). Imagine what Abraham felt when his greatest hope (a son from whom nations would arise) was put to the test. 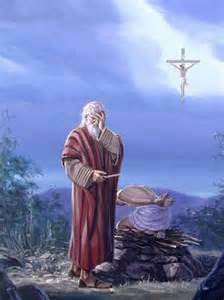 The God of Abraham commanded him to sacrifice Isaac as a burnt offering. This servant obeyed. He saddled up his donkey and set off on a journey to Mount Moriah with his son. What happened next is amazing. On the third day, Abraham looked up. He saw the place afar off. (Genesis 22:4) The Hebrew word translated “afar off” (KJV) actually has 2 meanings. The first is “from a distance”, which is the way it is usually taken. The other is “far off in time” as to “peer into the future”. While the mount was a distance away from the beleaguered Abraham, the 2nd meaning “far off in time” needs examined. If by “peer into the future” Scripture reveals God gave Abraham a vision “far off in time” of his plan of salvation then other passages related to Abraham’s faith are harmonized. Genesis 22:7-8 tells us Isaac wondered about the lamb to be used for the offering. Abraham replied by saying that God would provide the lamb. Yet, later, in verse 13, a ram was caught in the thicket and was sacrificed. Was Abraham wrong about the Lord’s provision? “Your father Abraham rejoiced to see my day; and he saw it, and was glad.” (John 8:56 KJV). “By faith Abraham, when God tested him, offered Isaac as a sacrifice. He who had received the promises was about to sacrifice his one and only son, even though God had said to him, ‘It is through Isaac that your offspring will be reckoned.’ Abraham reasoned that God could raise the dead, and figuratively speaking, he did receive Isaac back from death.” (Hebrews 11:17-19 NIV). When we gather and study the sacrifice on Mount Moriah (the site of the Temple Mount in Jerusalem), it paints a picture of a journey Jesus took. As did Abraham, in obedience to the Father he rode on Palm Sunday toward Mount Moriah on a donkey. Abraham looked up on the 3rd day, while Christ rose on the 3rd day. Isaac, the son to be sacrificed, carried the wood for the offering and Jesus carried his cross.